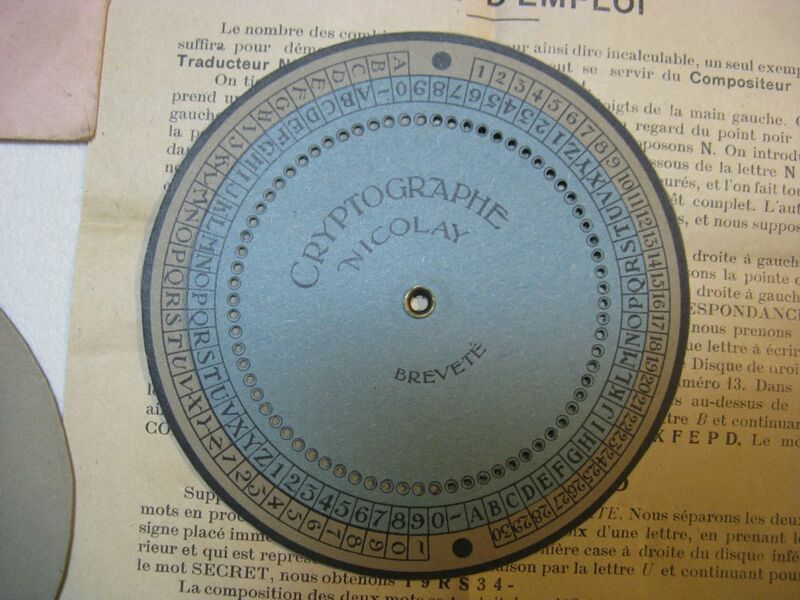 I would be most appreciative of any information regarding this cipher disk. 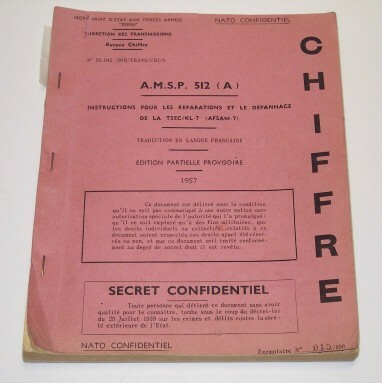 Absolutely no other information on the web or searched texts so far, nor from international museums including the Imperial War Museum in Great Britain. 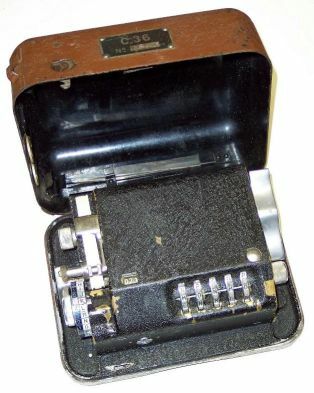 Click for larger photo Source: Personal Collection U.S. Army cylindrical cipher device (1922 onwards). 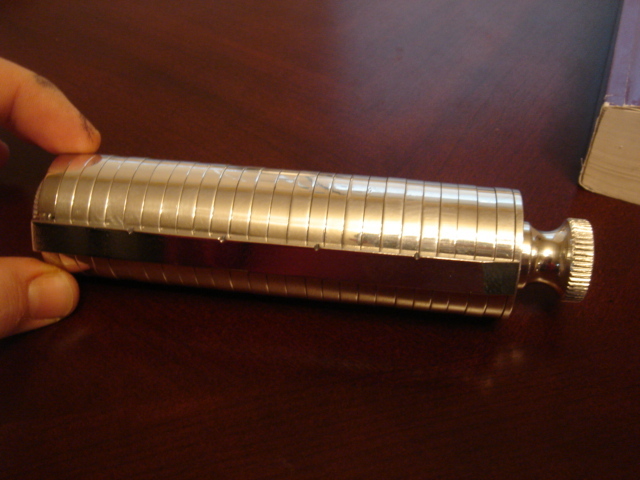 The aluminum cylinder is made up of 25 coded wheels with each having a different but specific permutation of the alphabet. 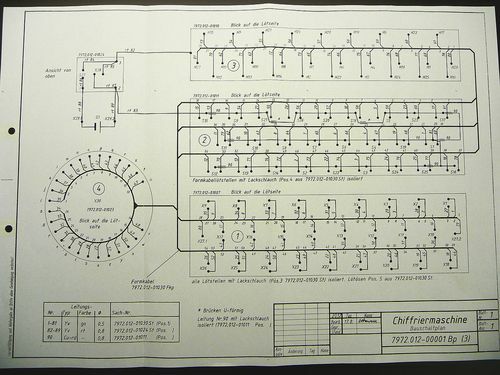 Each wheel was indexed accordingly and they could be ordered in a manner determined by a key list. 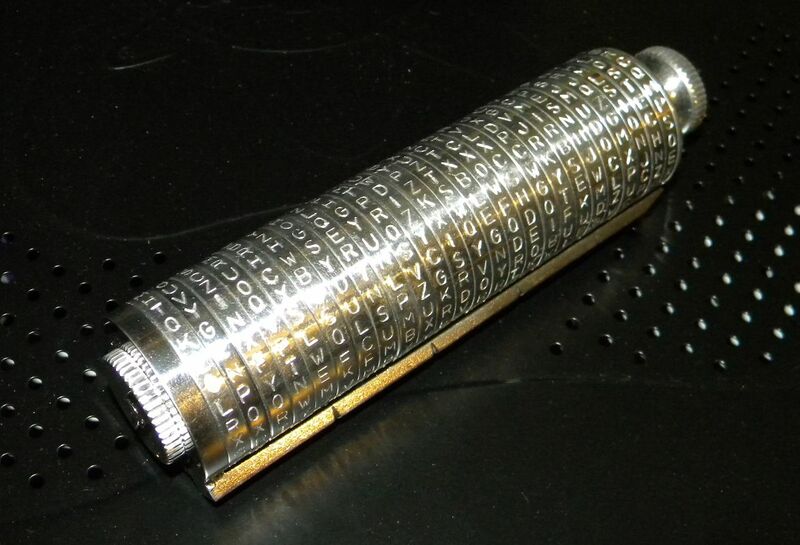 There's much on the web for this cylinder with one on Wikipedia. 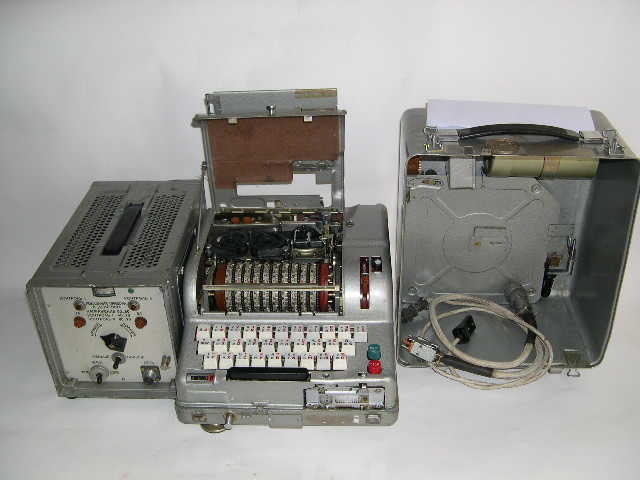 Please click on this Wikipedia entry on the history of Hebern cipher machines. 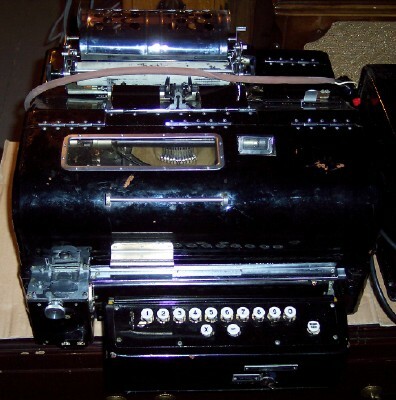 Please click on this Wikipedia entry on the history of Kryha cipher machines. 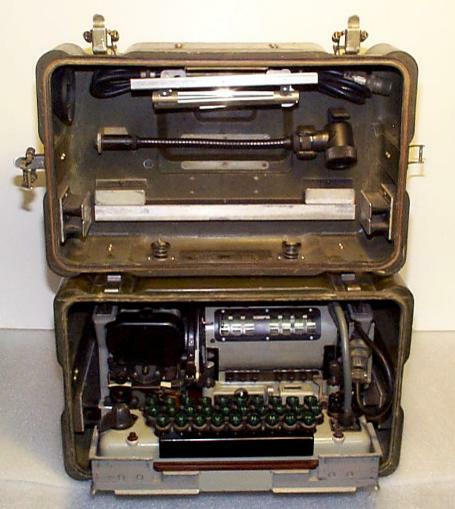 Please click on this Wikipedia entry on the history of the 4-rotor naval Enigma. 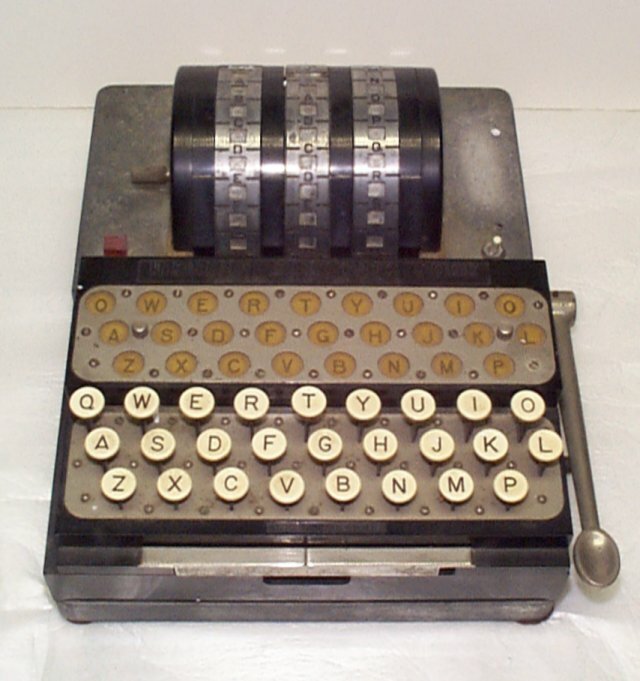 Please click on this Wikipedia entry on the history of the German Enigma. 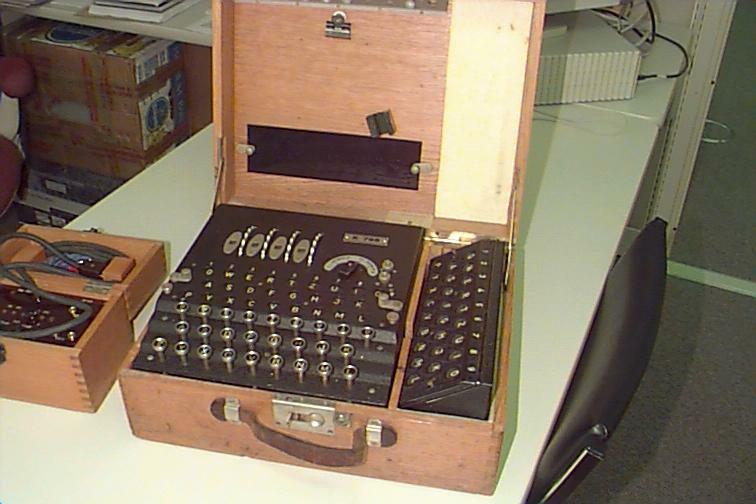 There are many websites devoted to Enigma and its history including this site (from Wayback Machine as the actual site is no longer around - thank you Sophie from Comparitech for alerting me to this!) 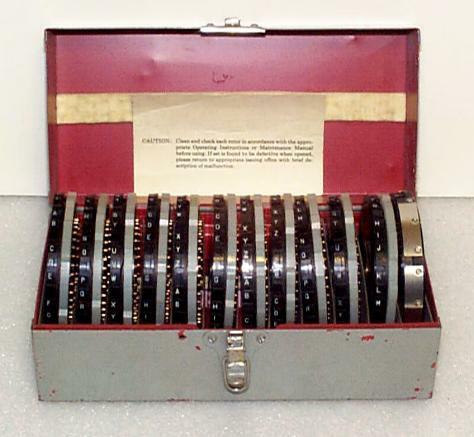 on the origins of the Enigma/Ultra operation and this site on Enigma codebreaking which has a photo of an 8-rotor Enigma which could arguably be Model B in the early commercial versions of Enigma? 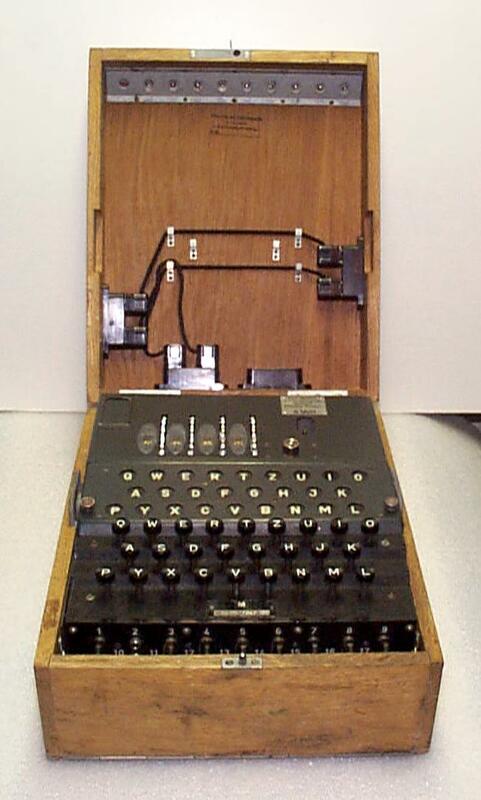 Please click on this armyradio.ch website on the history of the commercial K Enigma. 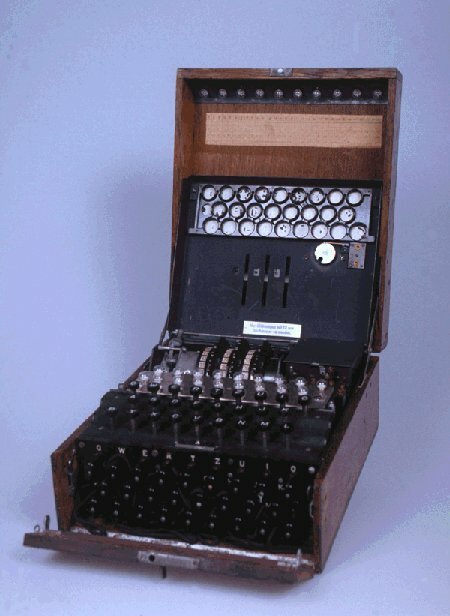 Please click on this Wikipedia entry on the history of the German Enigma. 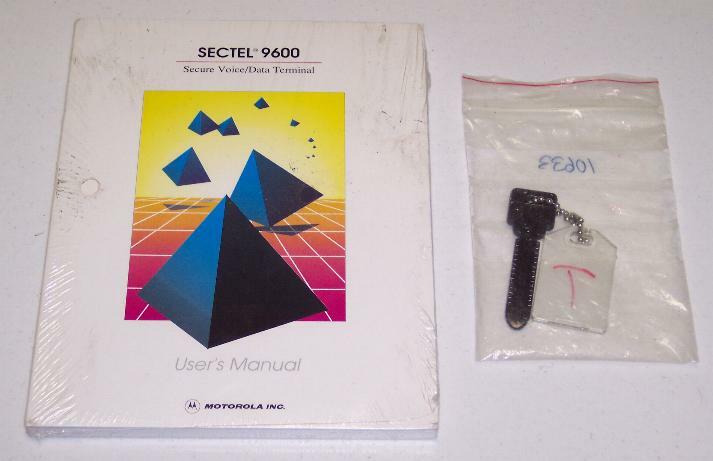 I have an extra manual to trade. 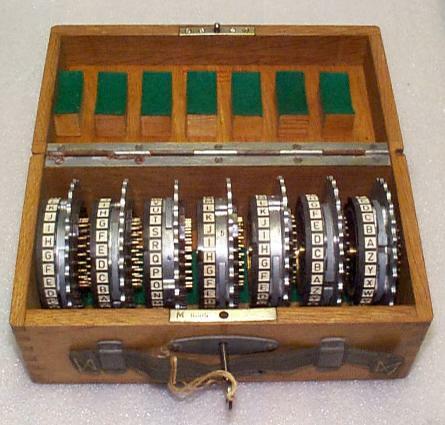 Please click on this Wikipedia entry on the history of the NEMA cipher device. 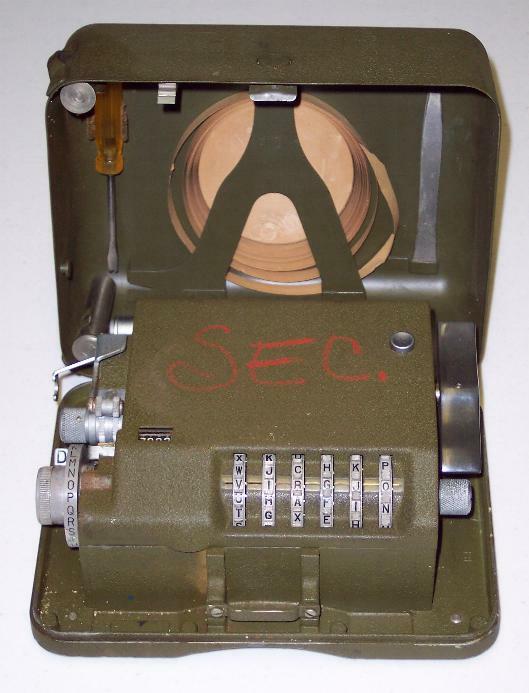 Please click on this Wikipedia entry on the history of the U.S./NATO KL-7 encryption device. 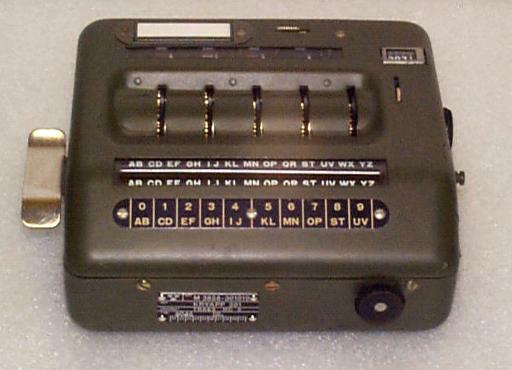 More information available at this German website on the Soviet M-125 MN Fialka system. 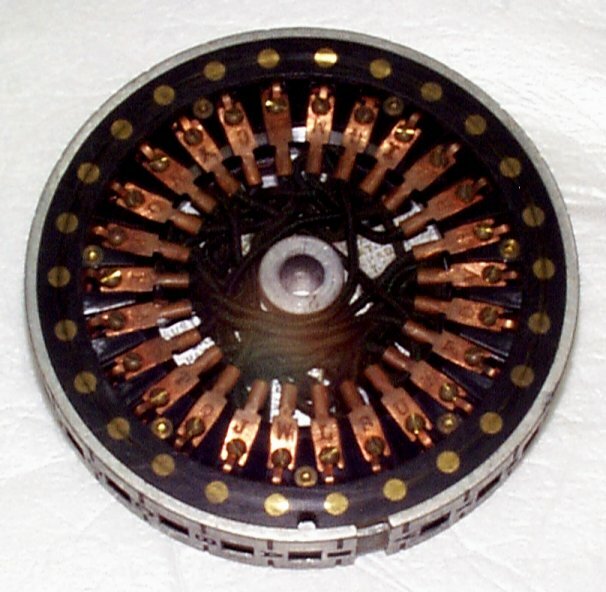 I would much like to find the crypto engine for this device - I have 5 of the main rotors. 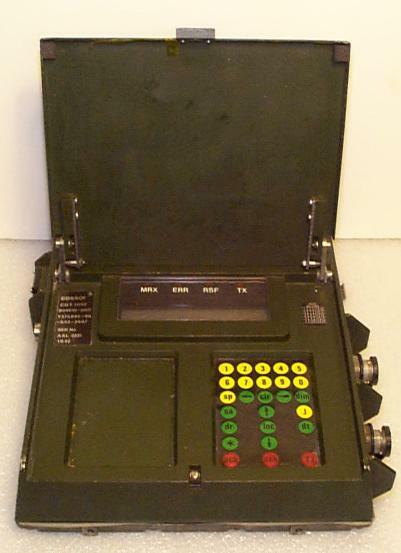 More information available at this German website on the Soviet M-130 Koralle system. 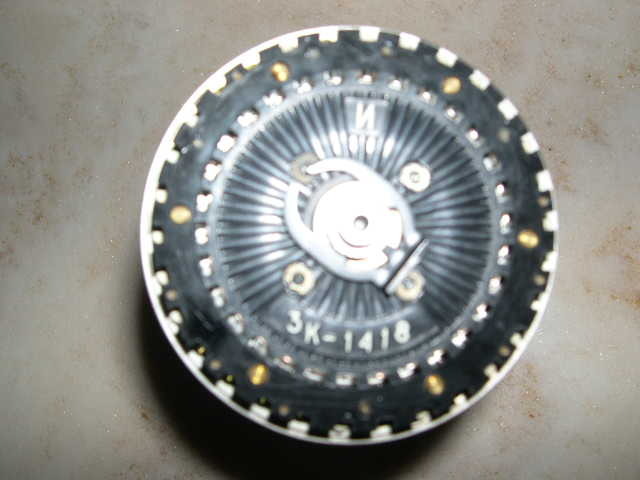 Click for larger photo Source: Personal Collection Rotors from a T-205 WECHA Soviet Block Rotor Encryption Device (1972 to 1982). 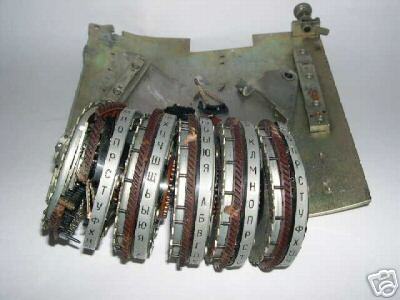 Rotors from a Soviet Block T-205 WECHA rotor encryption device - likely from 1972 up to 1982 (thank you Jurag and Jörg Drobick!) 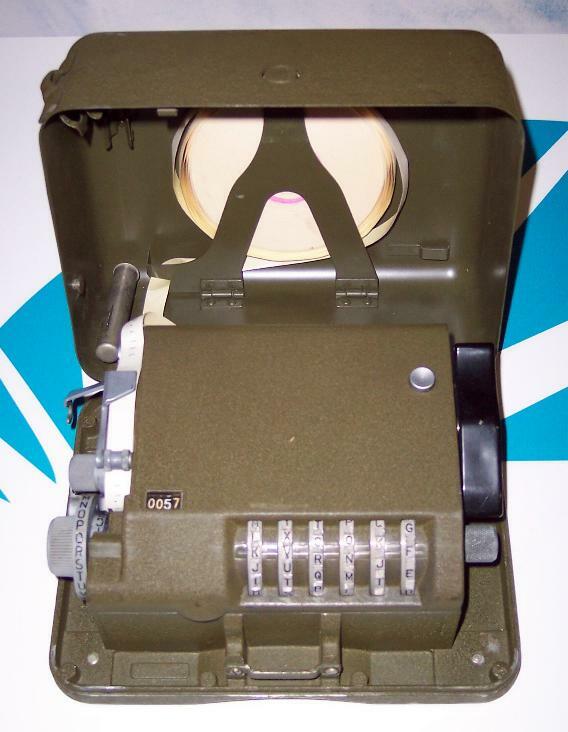 Additional information is available at this German website on the Soviet T-205 Wecha system. 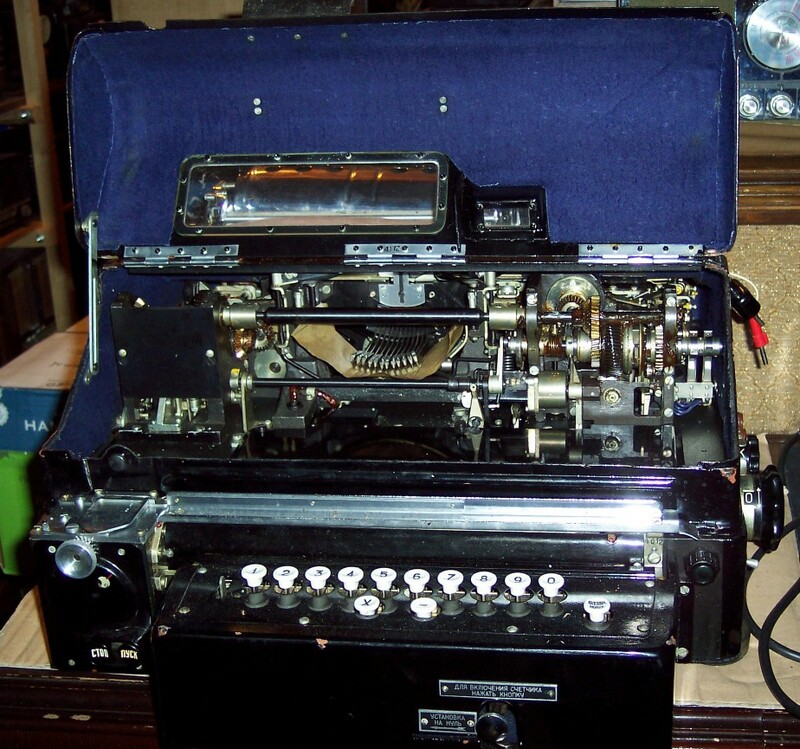 Click for larger photo Source: Personal Collection Hagelin C-36 Mechanical Cipher Device - 1936. 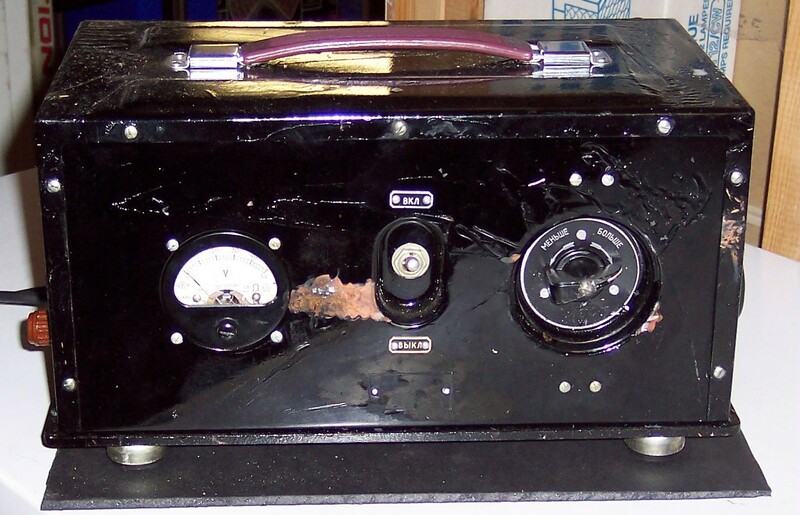 This device was produced by Hagelin in 1936 with one major purchaser being France. More information available at this Wikipedia website on the history of the C-36. 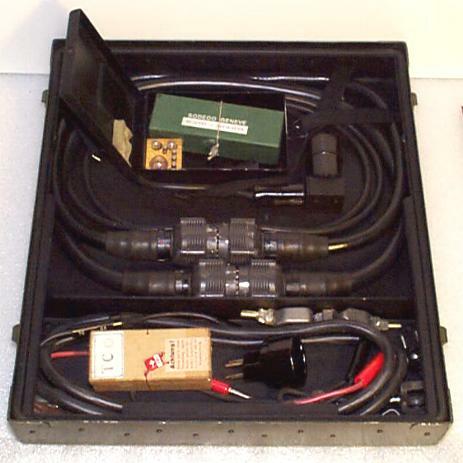 More information available at this Wikipedia website on the history of the M-209A, M-209B and CSP-1500. 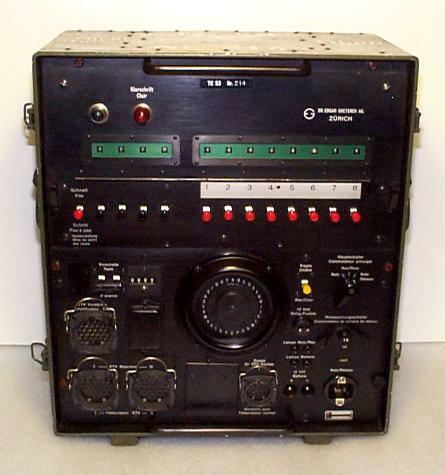 More information is available at this Wikipedia website on the history of the M-209A, M-209B and CSP-1500. 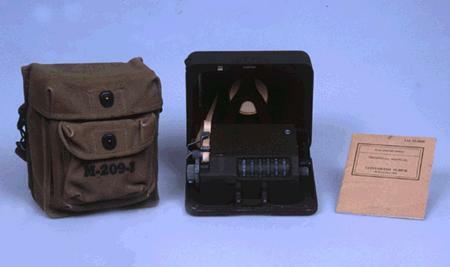 Additional information is available at this Wikipedia website on the history of the M-209A, M-209B and CSP-1500. 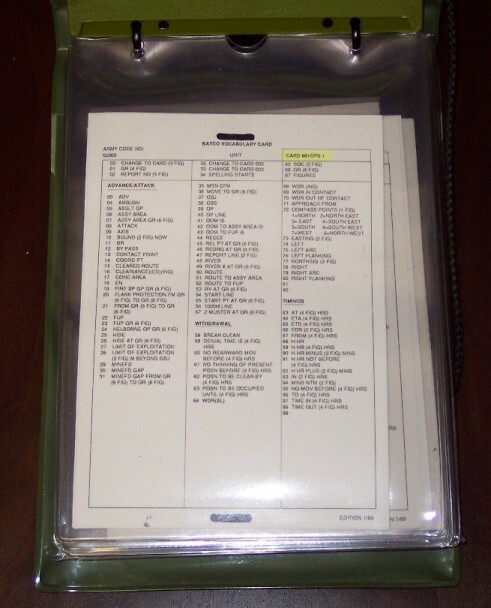 Click for larger photo Source: Personal Collection U.S. KOK-1 Encryption System. 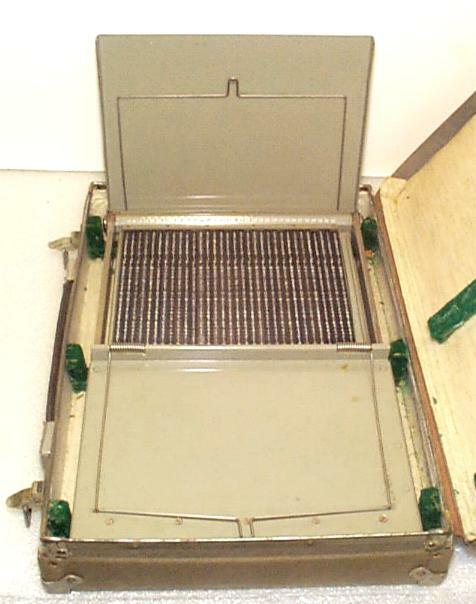 Permutor tray in its plastic storage case. No additional information on web. More information available at this Wikipedia website on the history of the C-52 and CX-52. 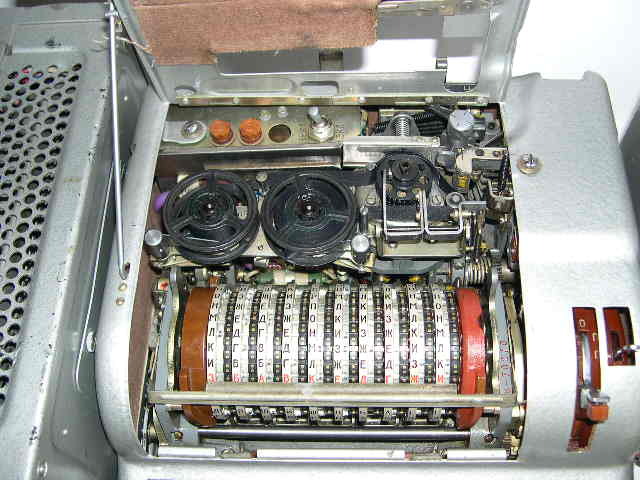 There's also an excellent technical webpage by Dirk Rijmenants on the C-52 and CX-52. 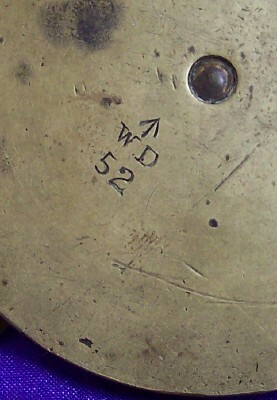 More information available at this Wikipedia website on the history of the CD-57. 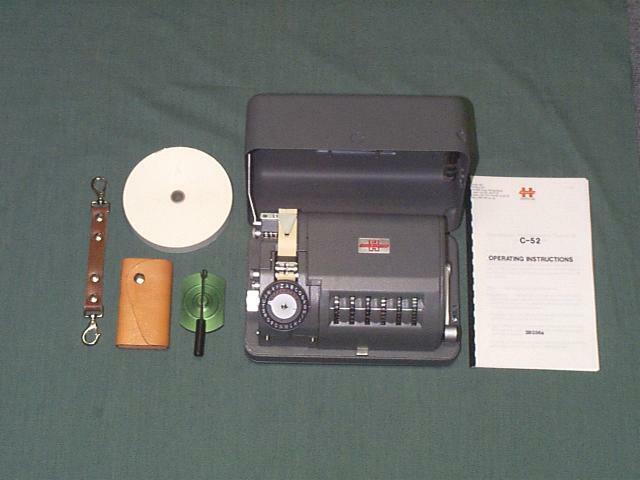 There's also an excellent webpage with photos and simulator for the CD-57. 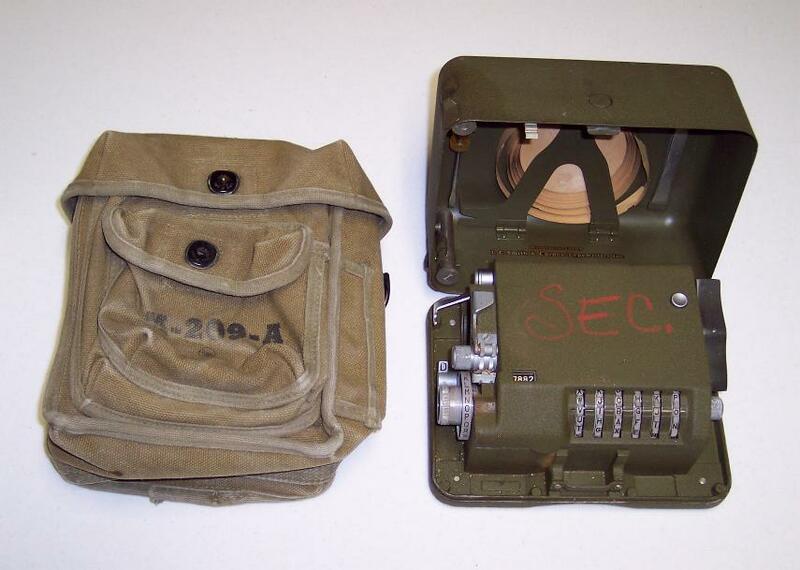 Click for larger photo Source: Personal Collection HC-9 (Swedish Device). 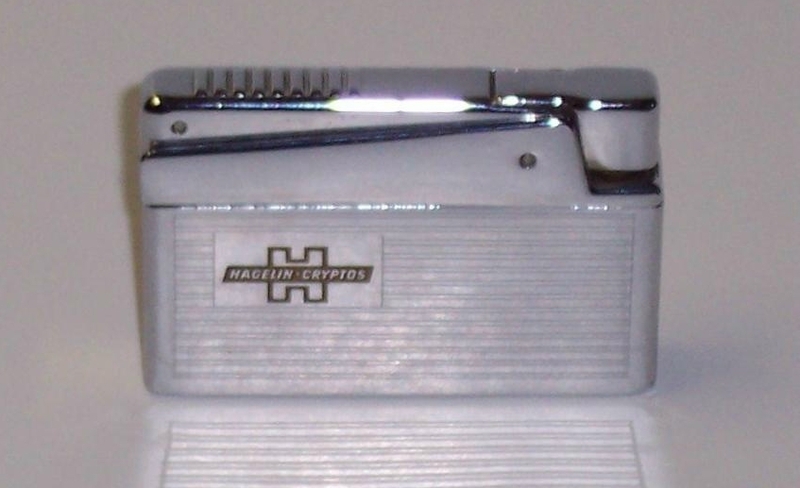 The HC-9 was produced by the Swedish company AB Transvertex in the 1950's through the 1970's timeframe. 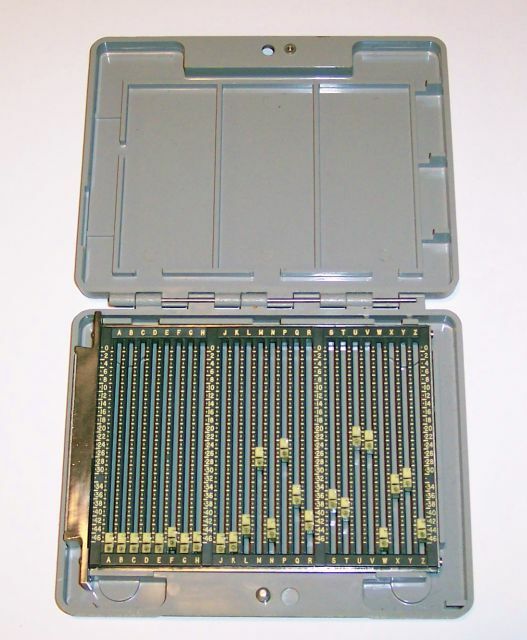 A basic component for this machine was the use of punched cards which emulated pinwheels. 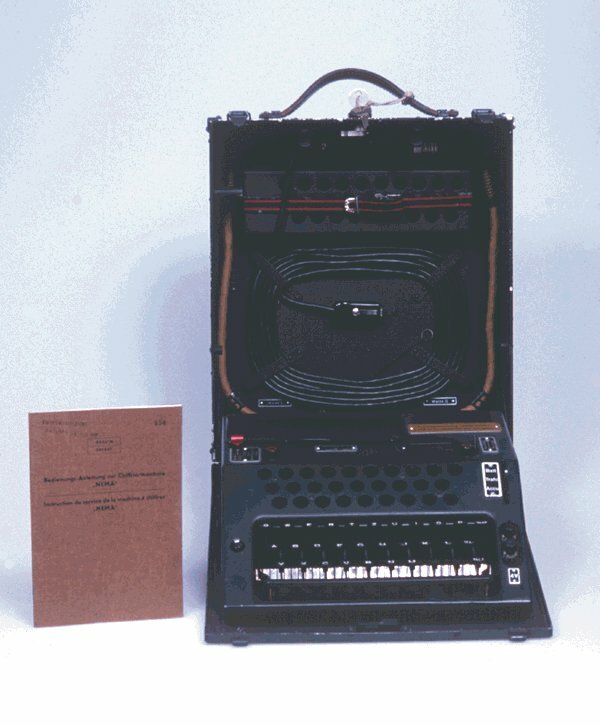 More information available at this Wikipedia website on the history of the HC-9. 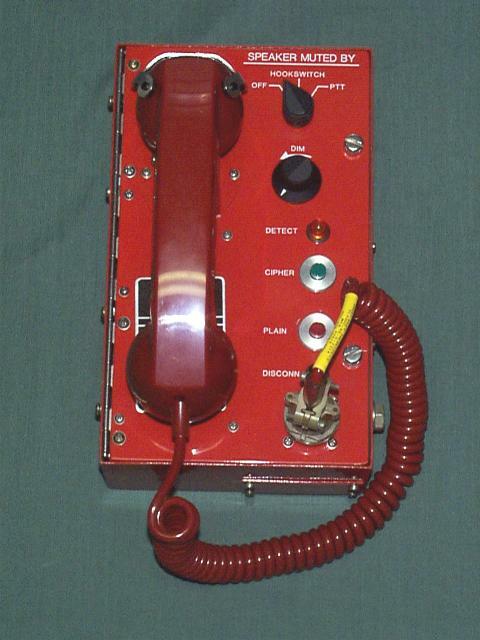 There's also an excellent webpage with photos and significant details for the HC-9. 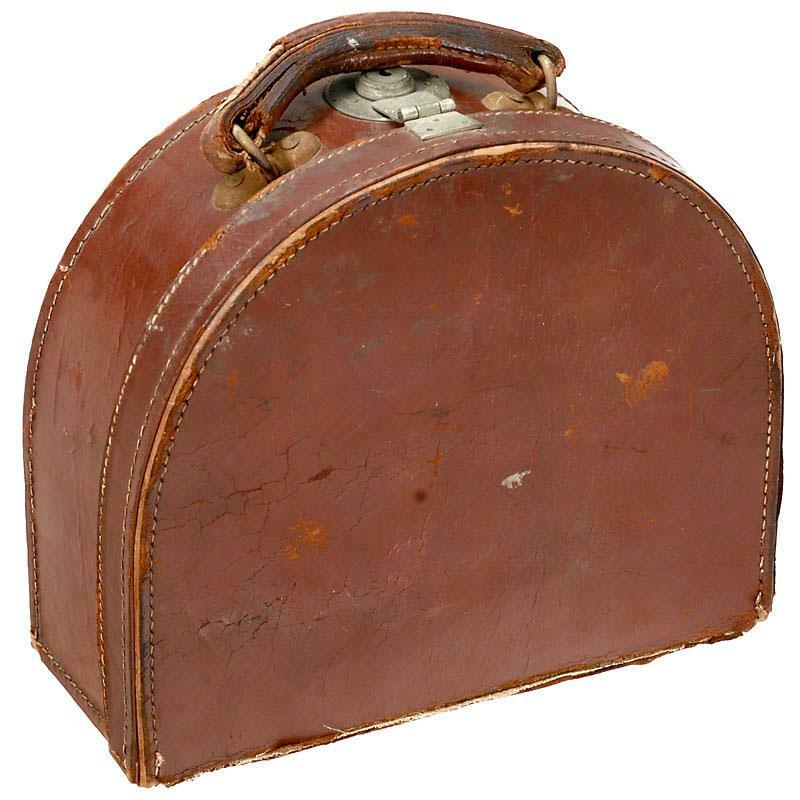 More information available at this website by Jerry Proc with significant contributions (background and photos) by Walter Schmid. 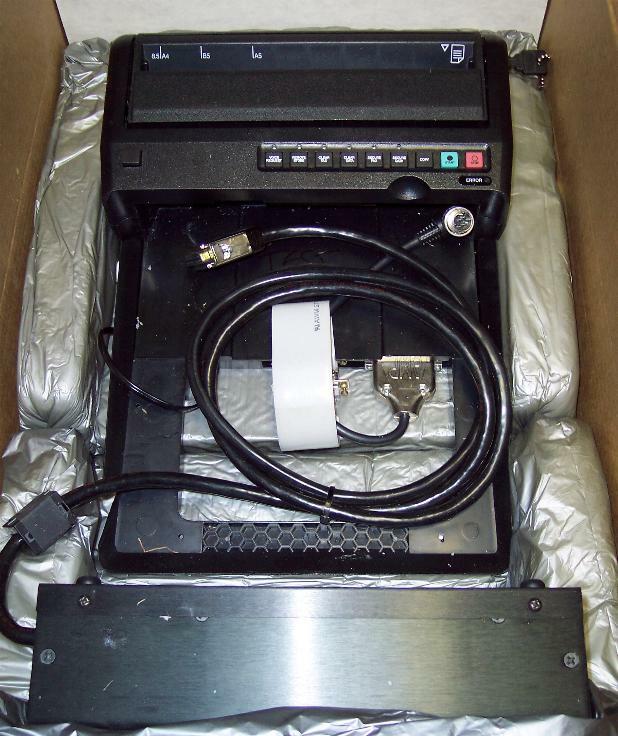 No other information on the web has been found for this device. 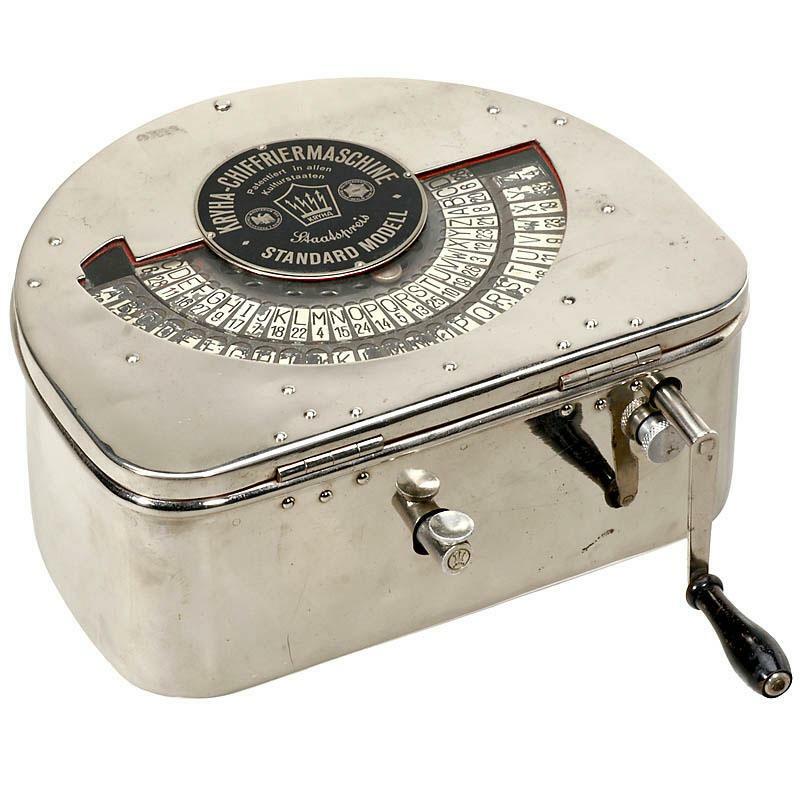 No other significant information on the web has been found for this device. 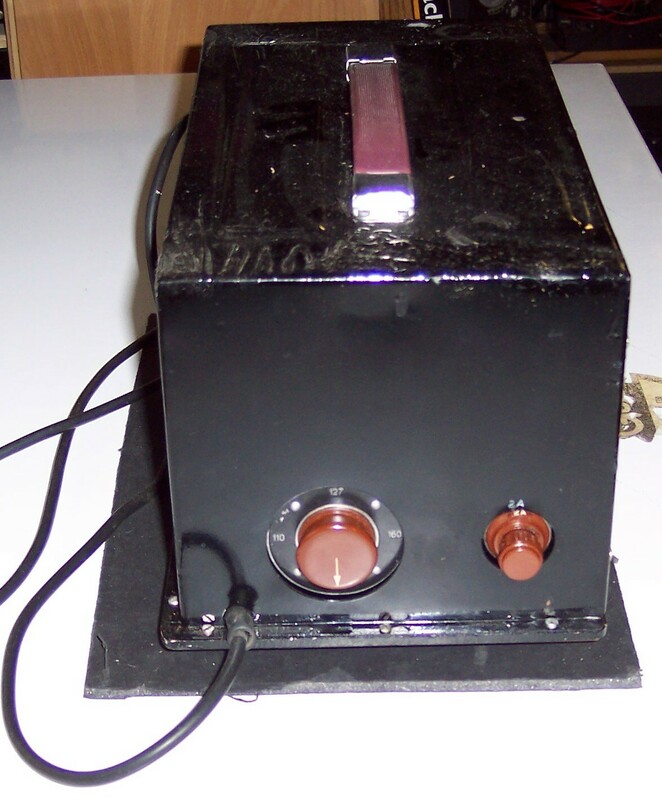 No other significant information on the web has been found for this device aside from this photo on eBay in January 2009. 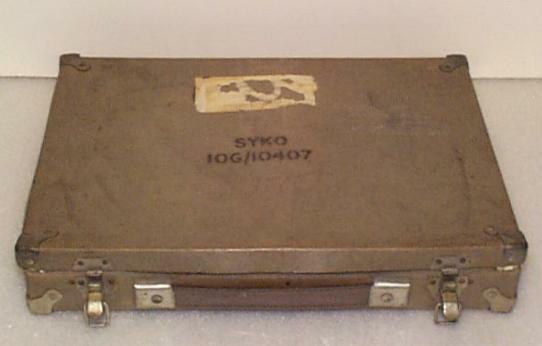 "SYKO was a transposition-like cypher which had been developed by the R.A.F. 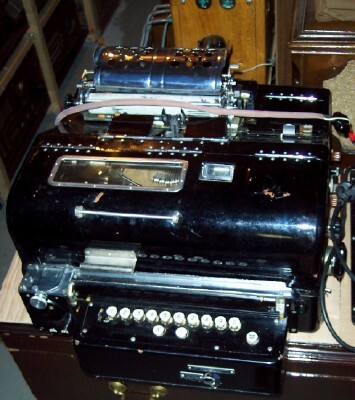 for conveying secret intelligence by means of wireless telegraphy. 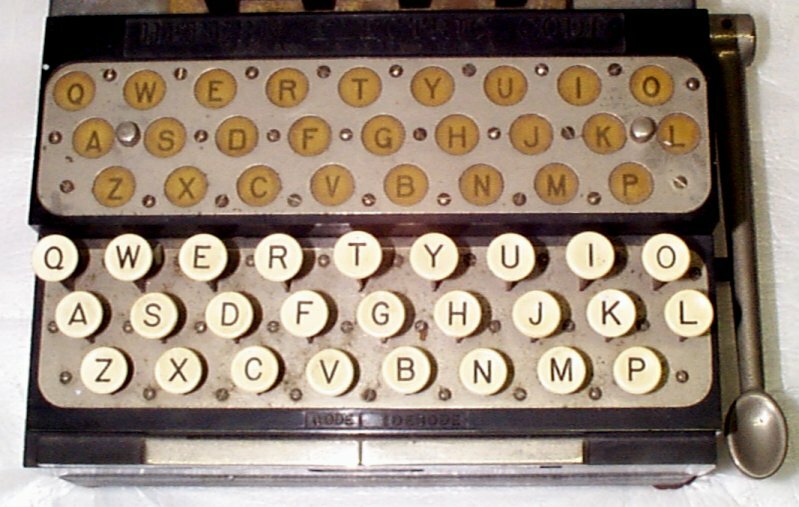 The word "SYKO" was presumably coined from the first syllablesof phonetic pronunciation of the words "Cypher" and "Code". 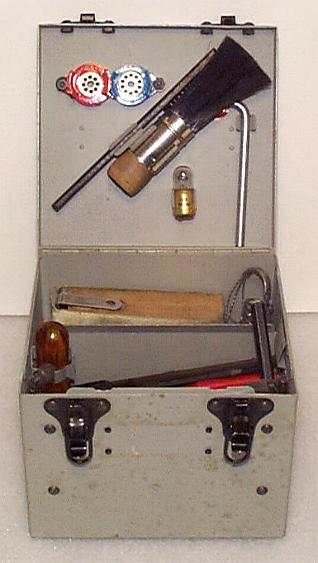 Of course, the methods used by the R.A.F. 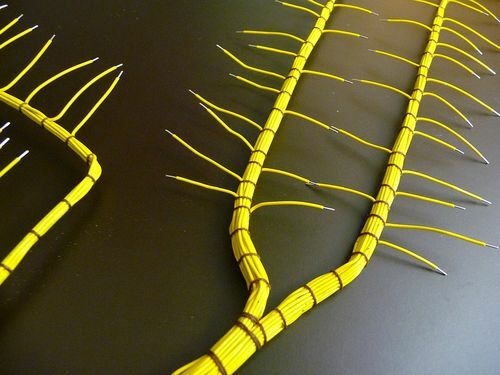 for preparing SYKO messages are quite different from those we have been discussing here, but - and this is an important point - practice in preparing messages of the SYKO type can be obtained by following the suggestions made in this article. 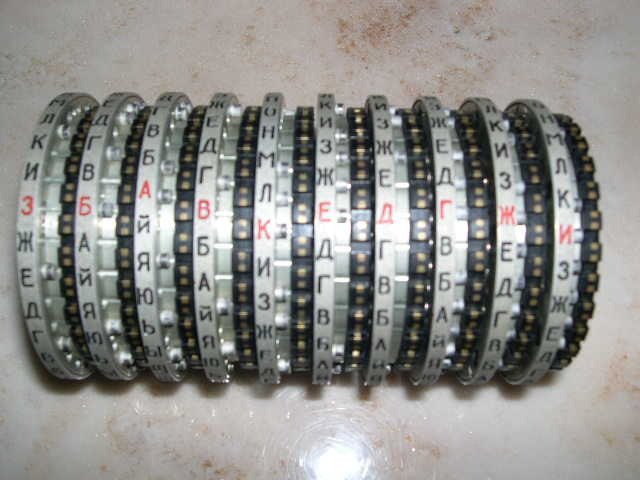 In the SYKO system a plaintext letter may be represented by a large number of different cypher letters or numerals. 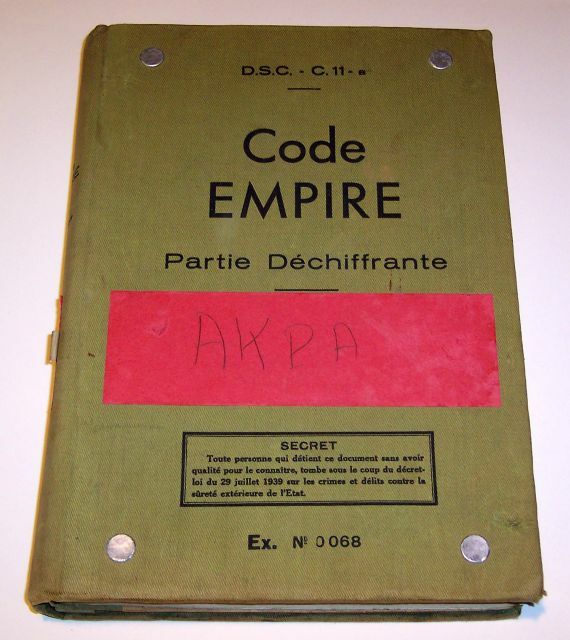 Furthermore, the cypher groups ued for any one day are never employed again, which means that even if the enemy captured a SYKO card it would be of no use to him the following day." In the previous paragraphs for this article, the author (John Sinclair) used the term "transposition" when he most likely meant to write "substitution". I have an extra one of these if anyone wishes to trade. 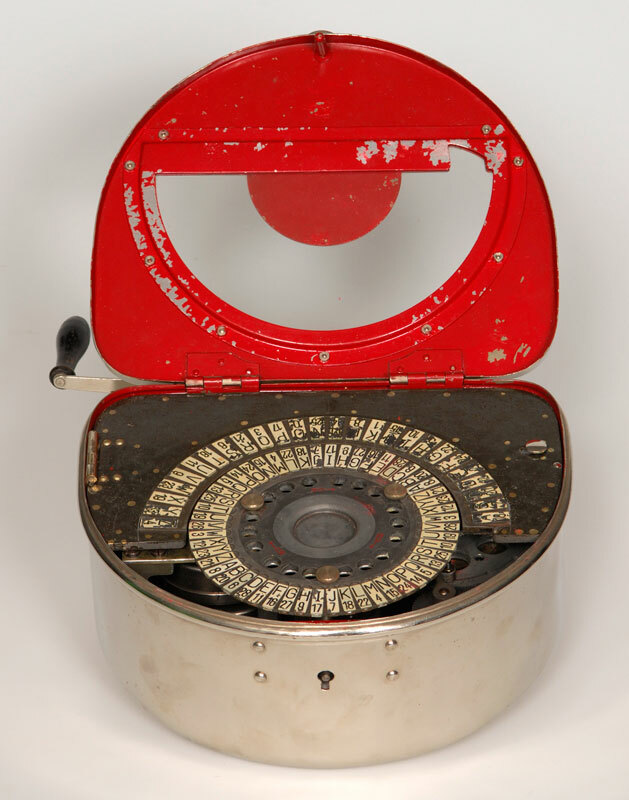 Light research reveals no other significant information on the web has been found for this device. 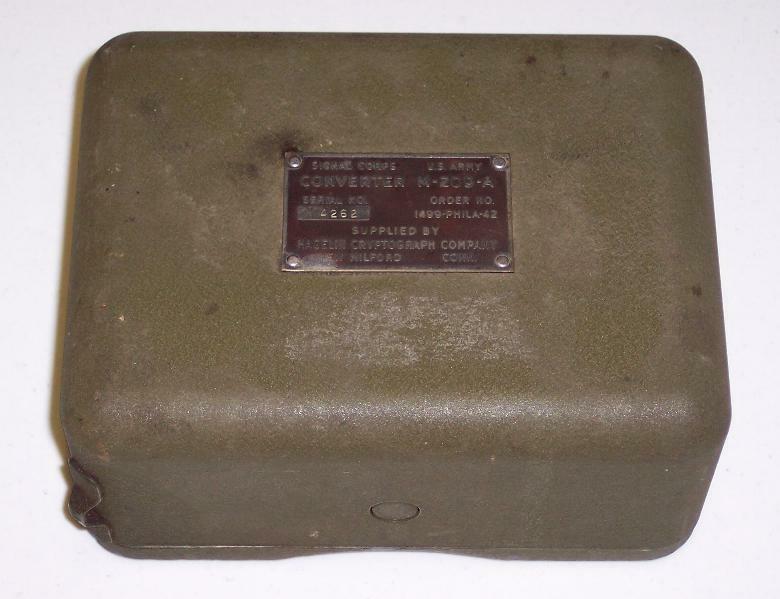 More information available at this Wikipedia website on the history of BATCO. 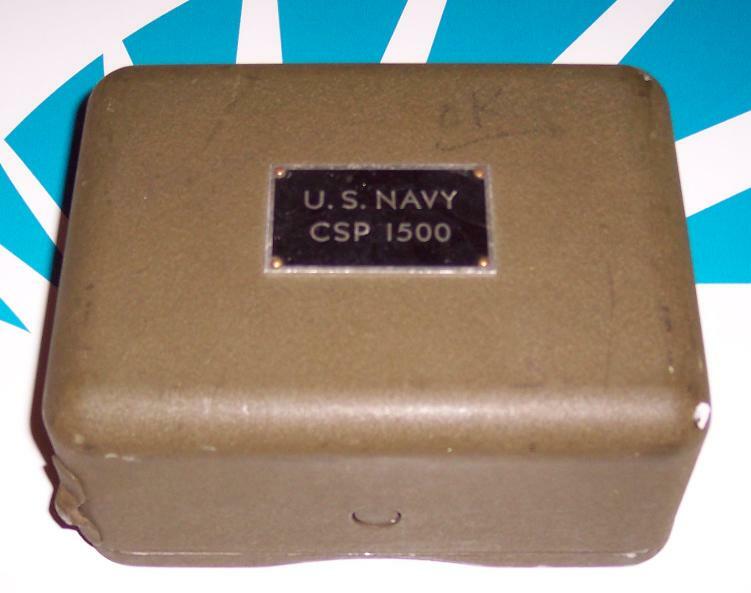 Very interesting information available at this USS Pampanito website including a copy of the Operating Instructions for the CSP-1750 and CSP-1756. 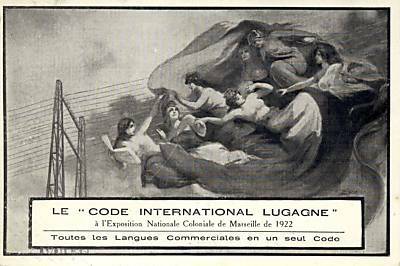 Click for larger photo Source: Personal Collection Insigna from the "Service du Chiffre" (French Military). 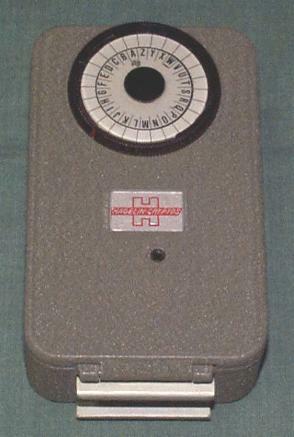 These were produced from 1946 until 1990 - the one pictured from my collection was likely issued in the early 1950's. 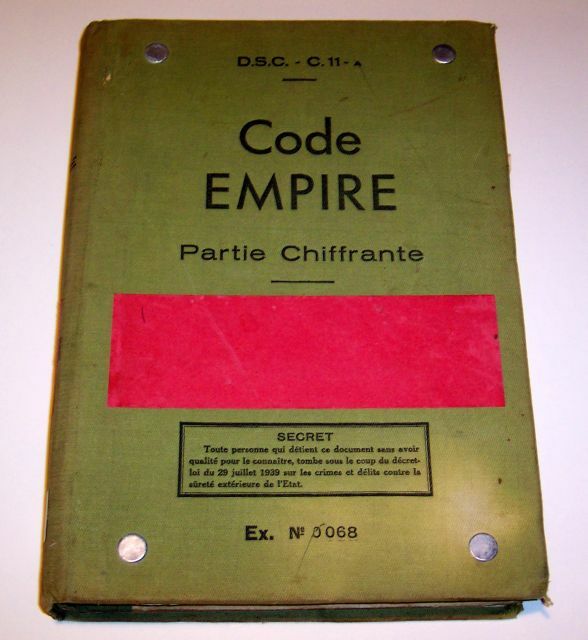 Here is a webpage titled De l'insigne du service du chiffre à l'insigne des spécialités SSI for excellent background information on these badges/insignas in France. 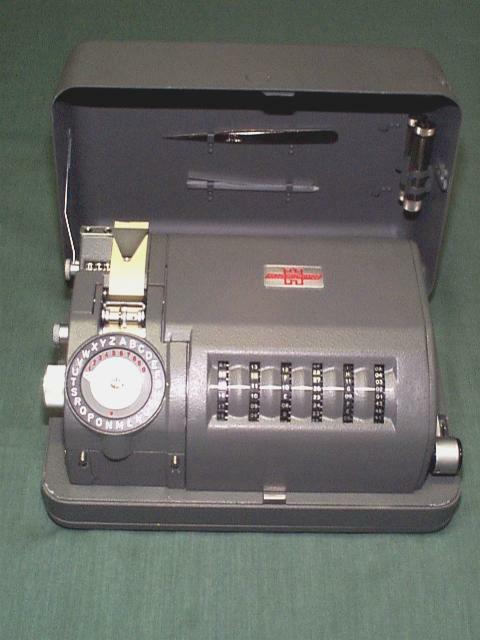 Please click on this Wikipedia entry on the history of STU-III secure phones. 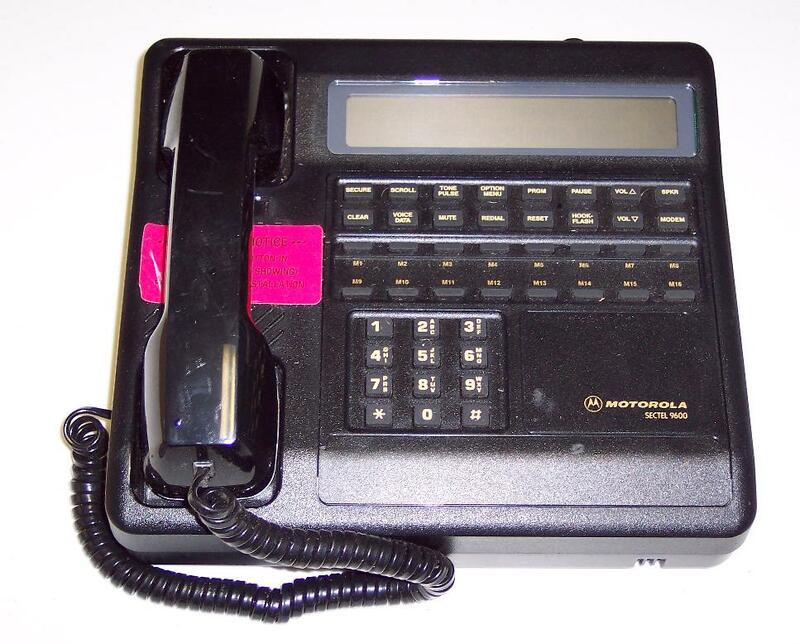 Click for larger photo Source: Personal Collection STU-III Secure Phone (Model 2100) by AT&T. 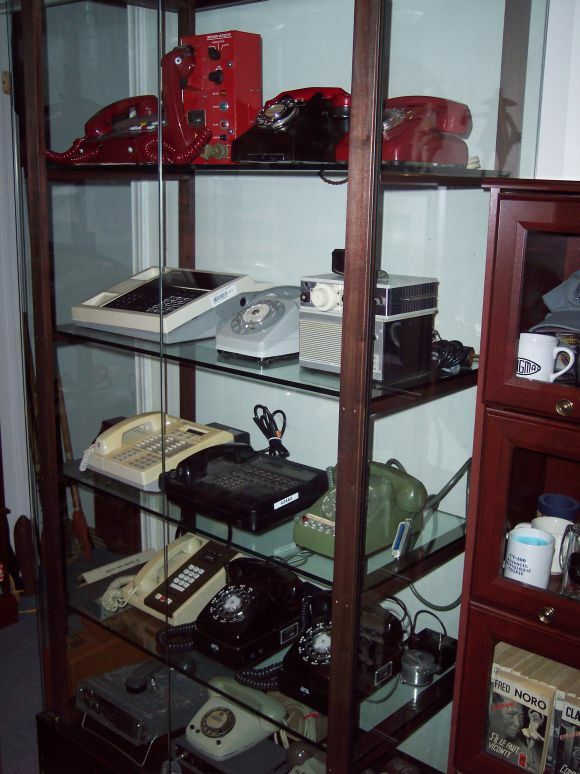 Please click on this Wikipedia entry on the history of STU-III secure phones. Click for larger photo Source: Personal Collection U.S. 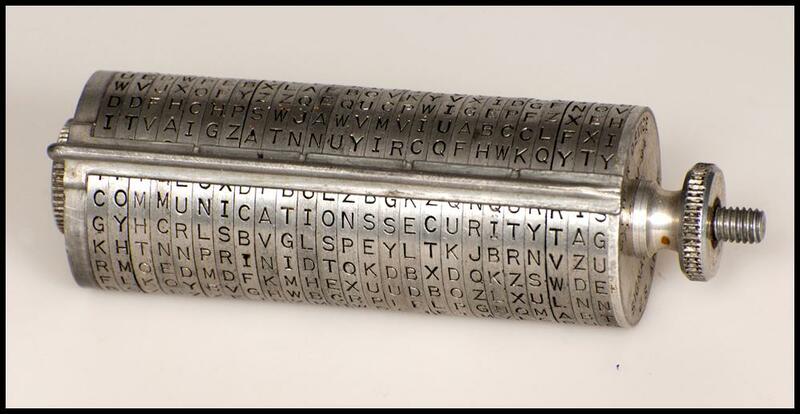 Naval Cipher Phone. 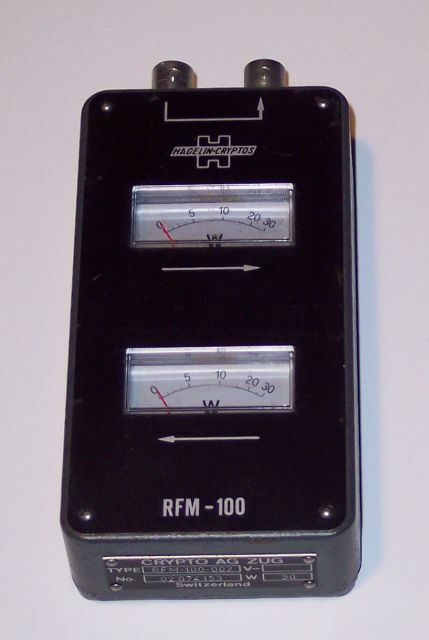 Wall Mount TA-840A/U by Naval Avionics Facility. 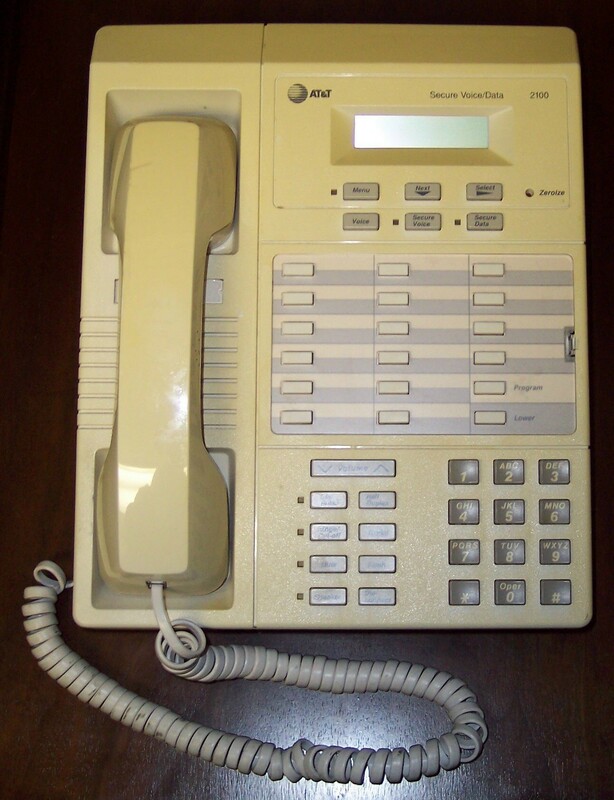 Only scant information on this telephone on the web. Click for larger photo Source: Personal Collection U.S. 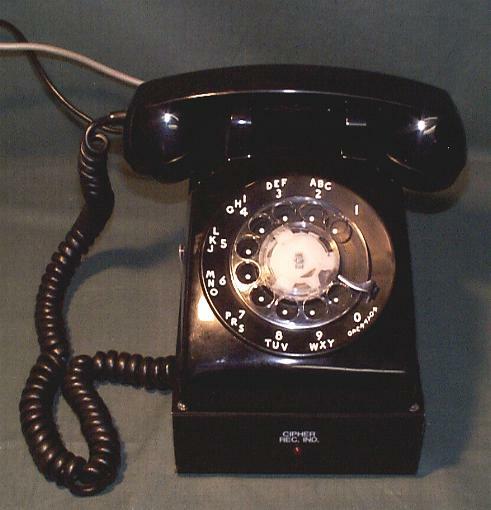 Secure Phone. 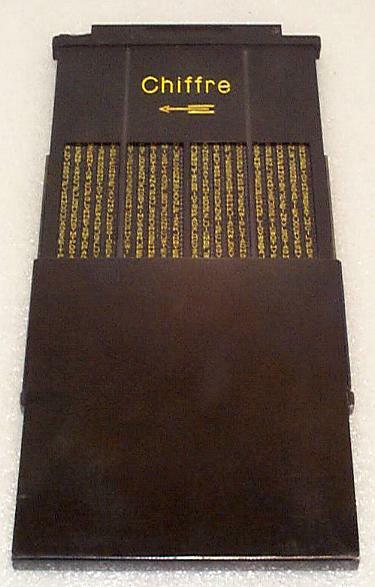 HYX-60/TSEC. 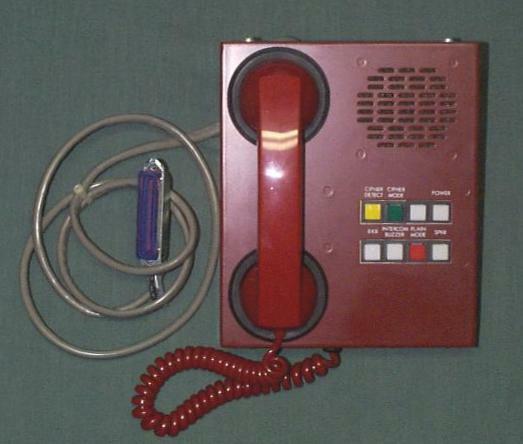 No other information on this telephone on the web. 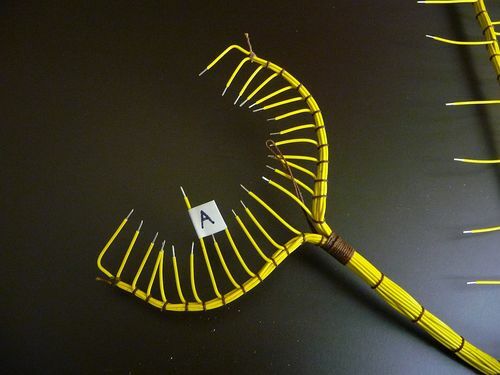 Click for larger photo Source: Personal Collection UK Keying Gear - Cossor. 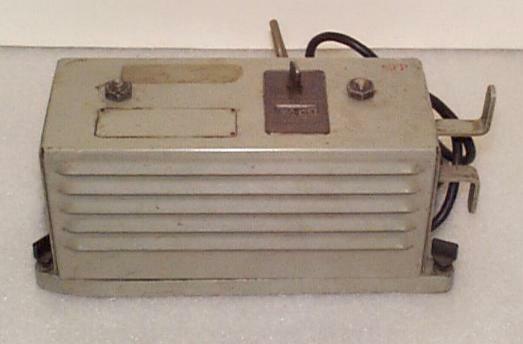 No other information on this keyer on the web. Click for larger photo Source: Personal Collection A.J. 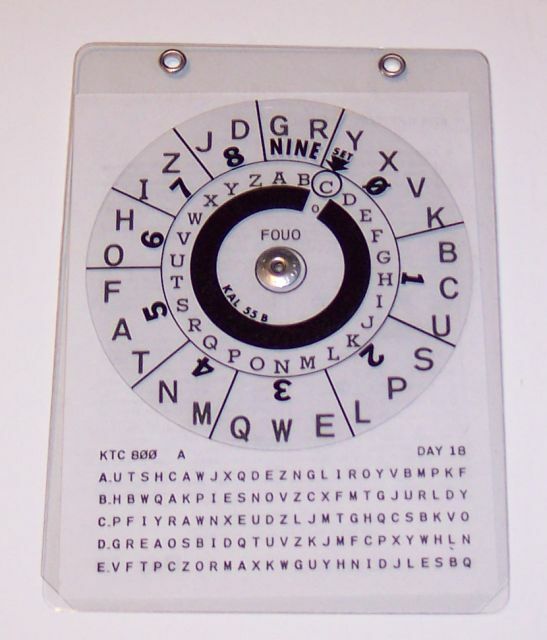 Myer Cipher Disk - 2009. 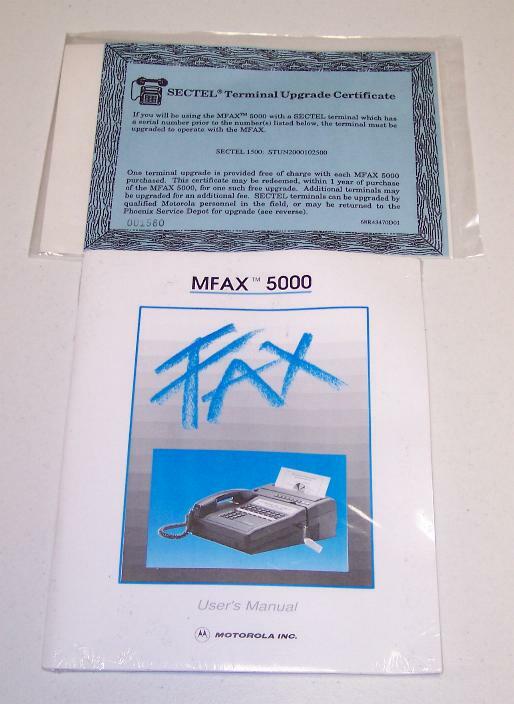 Purchased on eBay in March 2009. 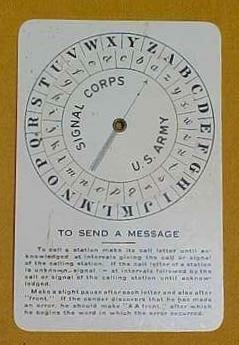 This is an excellent reproduction of a cipher code disk used by the U.S. Signal Corps from the American Civil War until the Spanish American War. 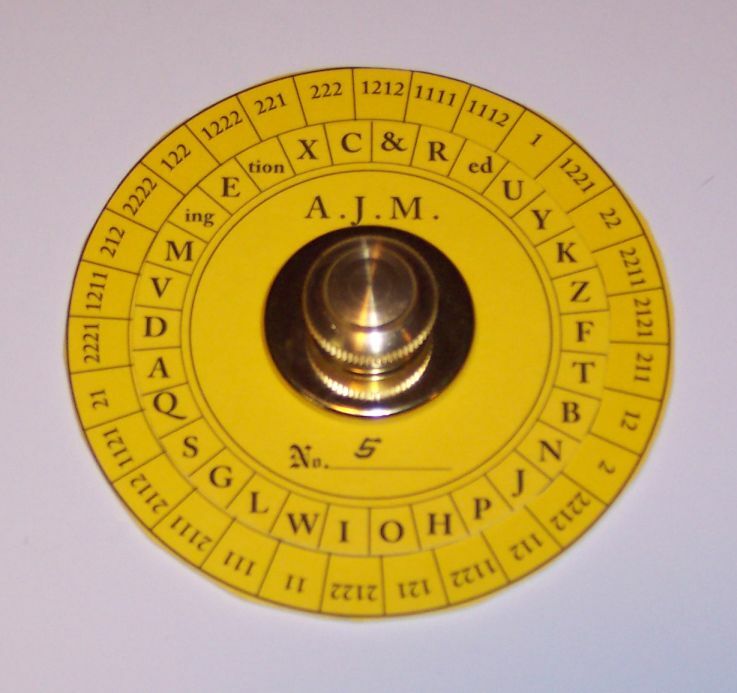 About 3.75 inches in diameter with heavy yellow card stock with base and turning knob in brass finish. 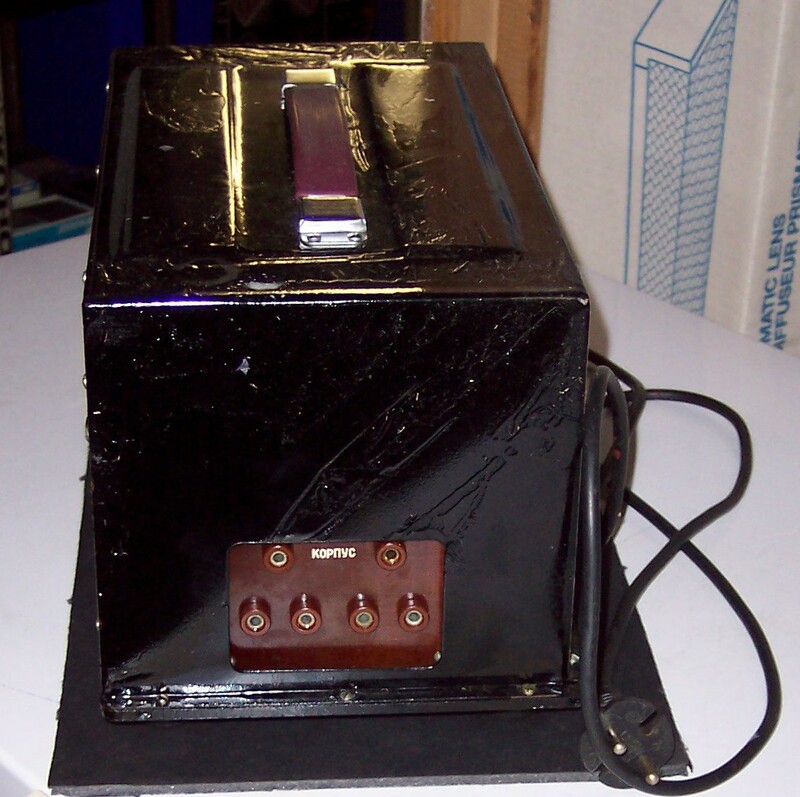 Based on the an original patent from 1865 by A.J. Myer. 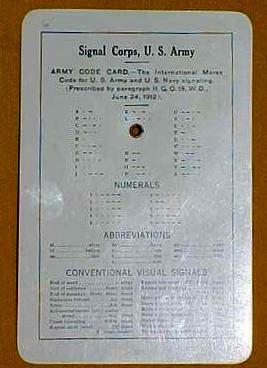 The disk came with a copy of the Myer patent and a page description on how to use the "Military Dot Code" with the disk. 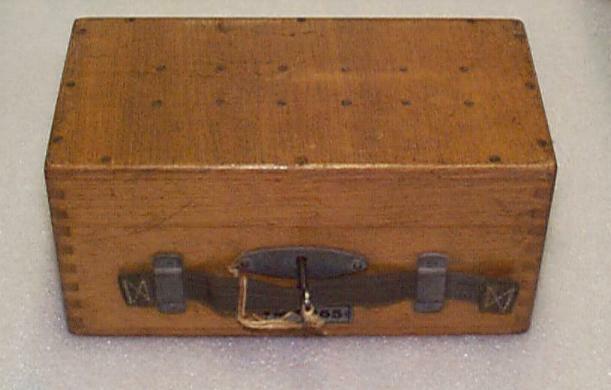 Further information can be found in the online book (originally written in 1882) "The Military Telegraph" which covers communications for both sides of the Civil War. I purchased mine for $21.50 USD shipping included. 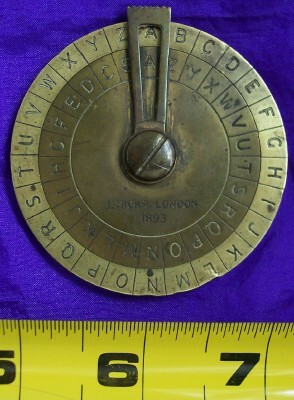 If you are interested in inquiring about this replica disk, you can contact the original designer through this email address arcy1947@yahoo.com with your questions. These are made in the United States by a handicapped stroke victim. 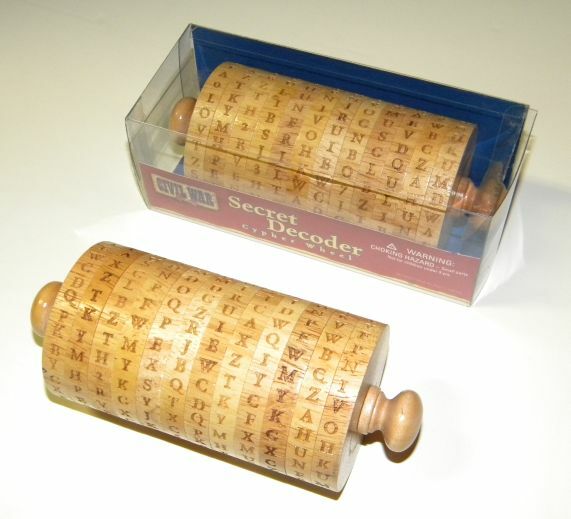 Click for larger photo Source: Personal Collection Civil War Secret Decoder. 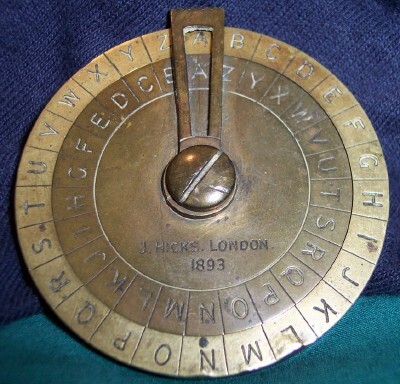 Civil War Secred Decoder Cypher Wheel - wooden production circa 2011. 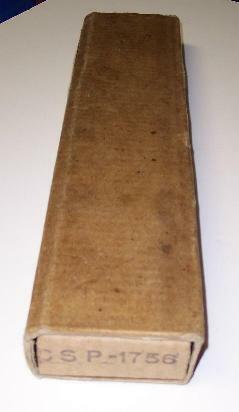 Purchased on eBay U.S. in October 2011. No other reference found on the web. 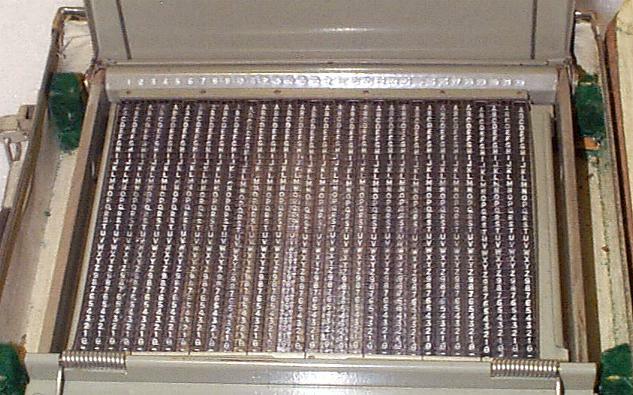 Click for larger photo Source: Personal Collection KAL-55-B Grille and Code Table - reproduction circa 2004. 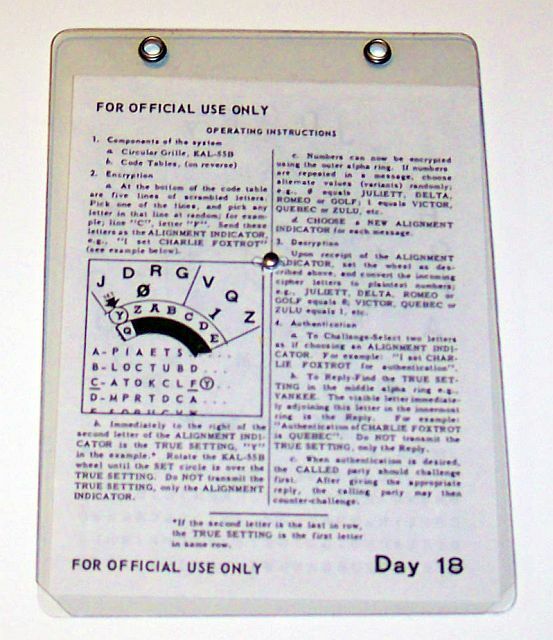 Here is the obverse of the KAL-55-B which details directions on usage. No other reference found on the web. 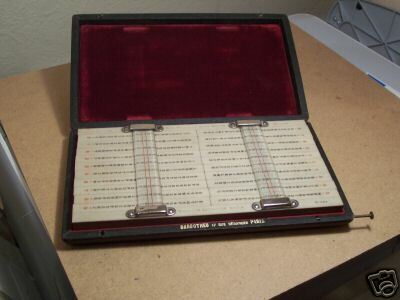 It is unmarked, without any letters or symbols. 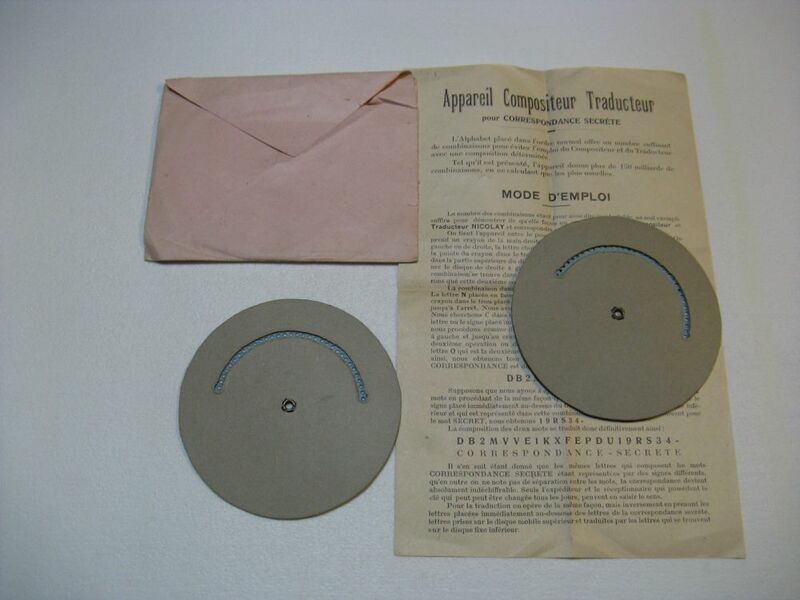 The new owner can stamp OR mill letters into the disks if they feel fit. Once you see this Device in person and hold it, you will be amazed by its quality craftsmanship and heavy weight.....no corners cut here. Click for larger photo Source: Personal Collection Crypto AG Complimentary Pen (Swiss made by Caran d'Ache). 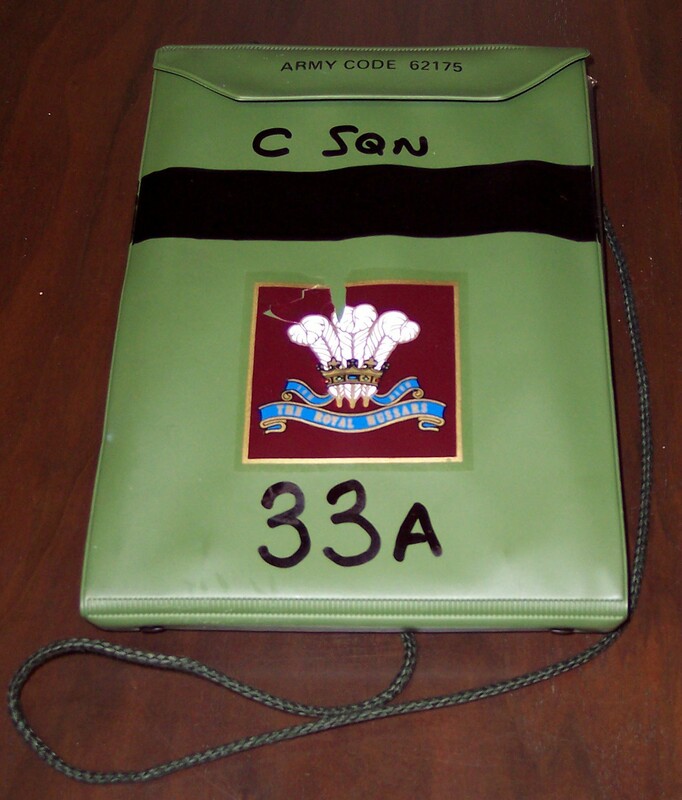 Purchased on eBay in 2007. 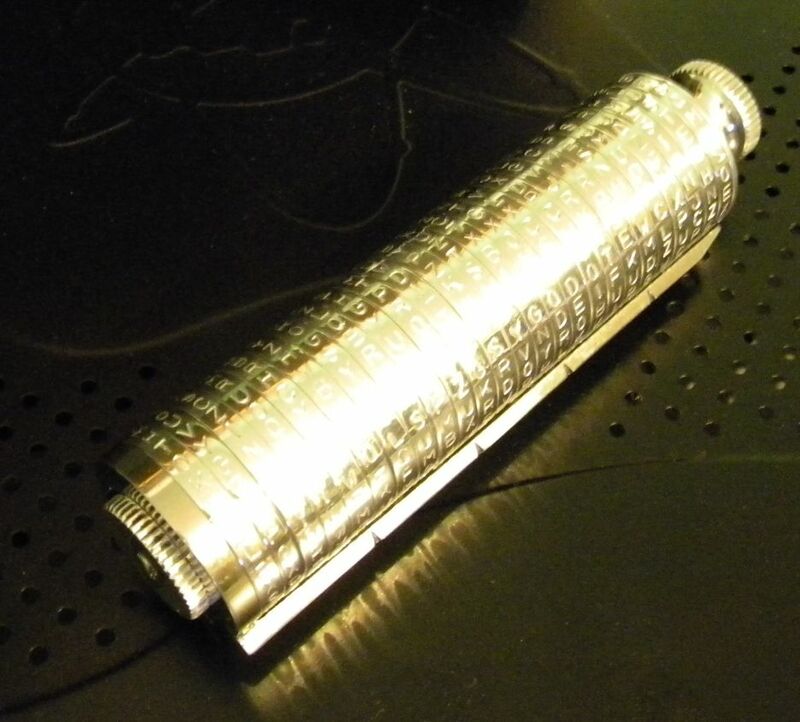 Click for larger photo Source: Personal Collection Hagelin Cryptos Complimentary Lighter. 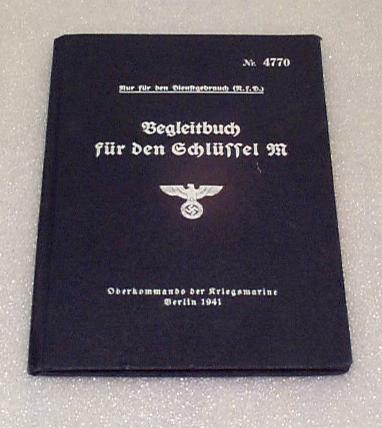 Purchased on eBay in 2007. 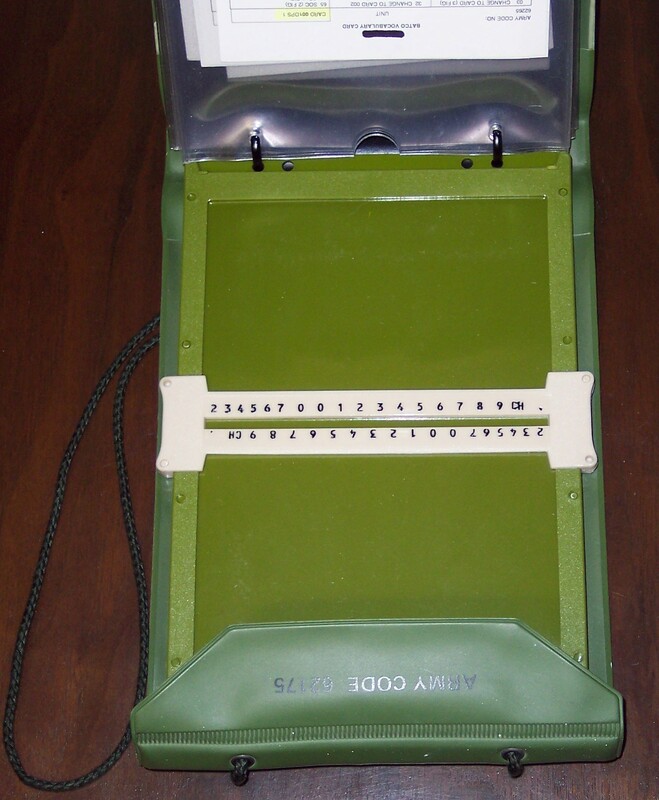 Click for larger photo Source: Personal Collection Crypto AG RFM-100 Meter - 1980's. 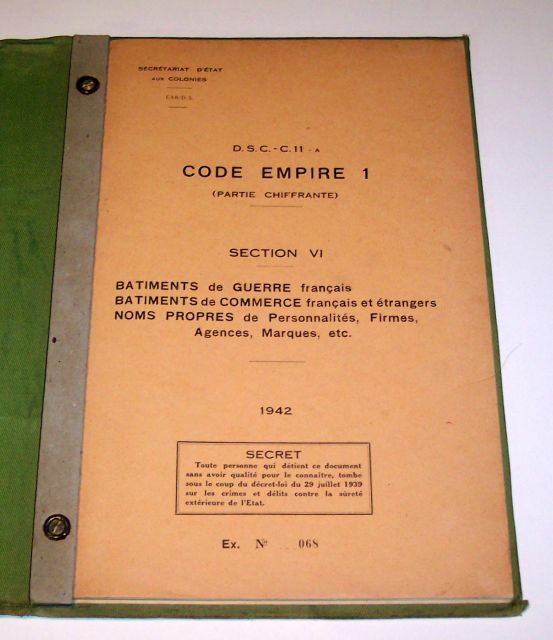 Purchased on eBay in 2008. 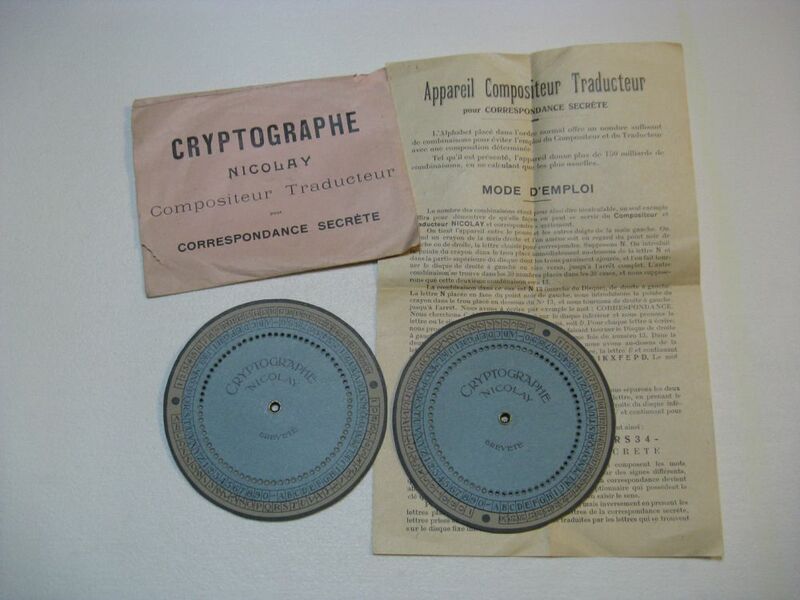 Likely used by Crypto AG technicians in the field. 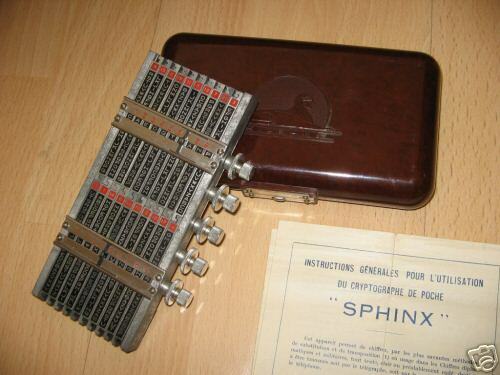 Click for larger photo Source: Personal Collection Crypto AG Swiss Army Knife. 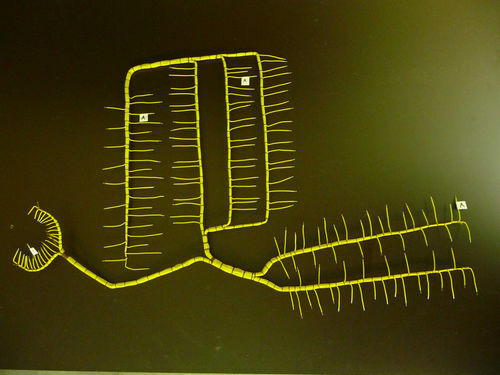 Purchased on eBay in 2008. 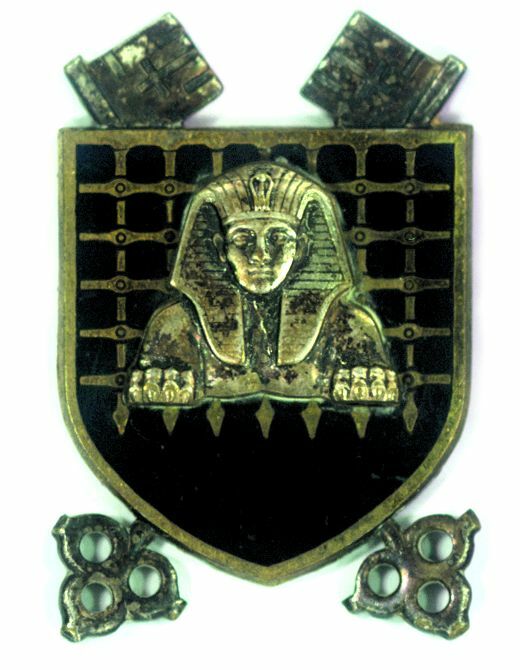 Here is the photo of the obverse of the knife. 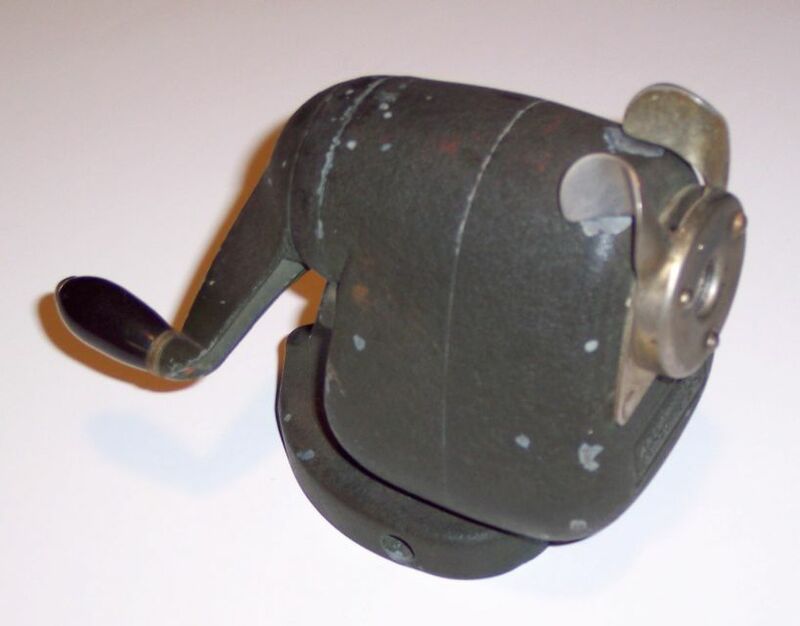 Click for larger photo Source: Personal Collection AB Cryptoteknik Pencil Sharpener - 1930's. 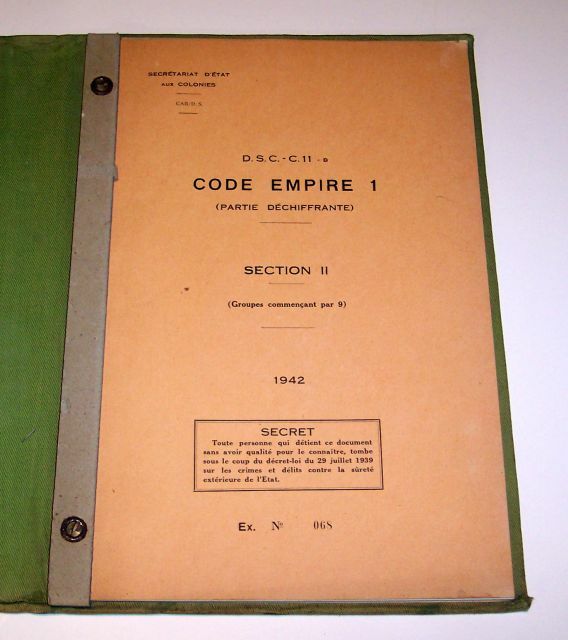 Purchased on eBay in 2008. 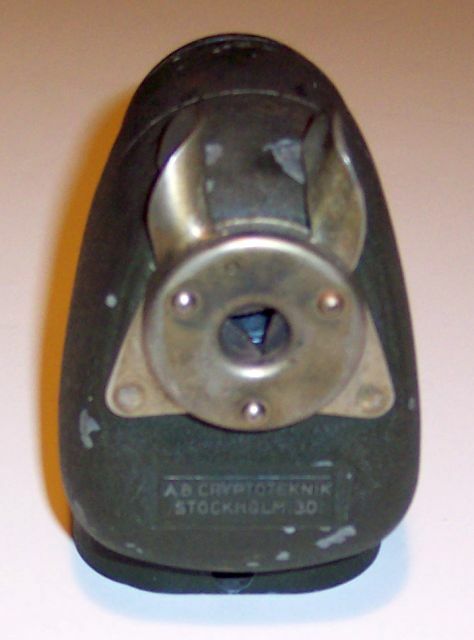 Here is the photo of the company marking on the sharpener. 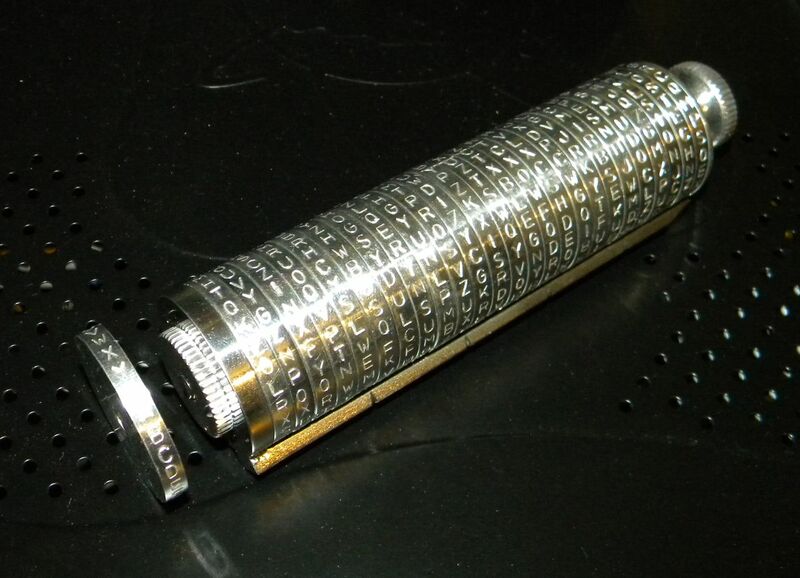 It appears that this company produced non-cryptographic items!